The fourth pattern for Tour de Sock was released Monday night. We all knew it would take 2 colors, so there was wild speculation as to what sort of pattern it might be. I was holding out for stripes, stranded, or mosaic – basically anything but brioche because that’s one thing I’ve yet to tackle and I didn’t really want to deal with it during a speed competition. Thankfully, the pattern – Mosaic Marbles – was just mosaic knitting. 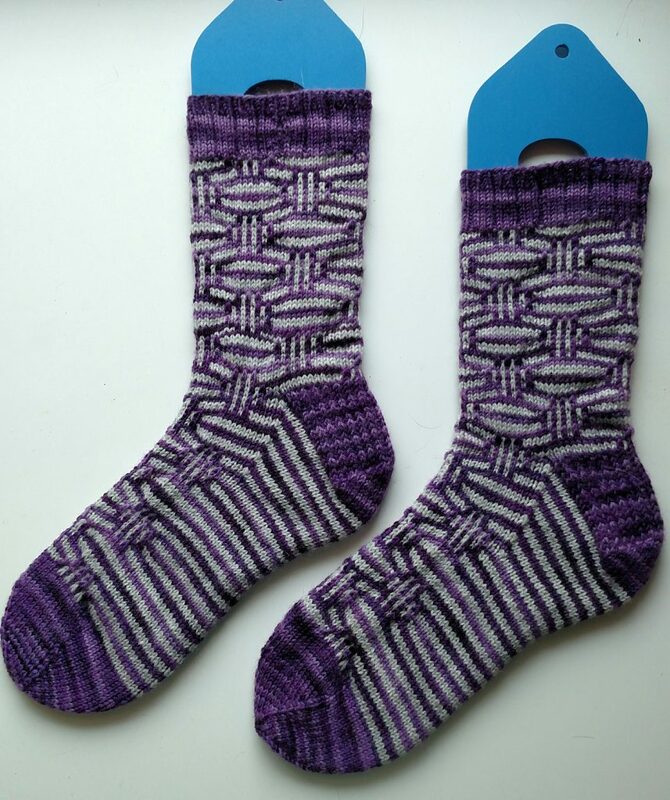 I’ve done mosaic socks before – I was the test knitter for these socks and I loved the pattern so much that as soon as I’d shipped the sample pair back to Knitpicks, I immediately cast on for my own. So I was actually pretty excited to see pattern #4. I surreptitiously downloaded the pattern to my phone and then emailed it to Richard while sitting in a meeting, and asked him to print it, figuring that’d give me a head start when I got home later (I’d already wound the yarn). Hah. Turns out the printer was out of black ink, and by the time we figured that out, every place that might sell printer ink was closed. No problem for the evening – I just camped out in my chair in front of the computer and followed along from there – but I was leaving the next morning for a two-day work trip and I really didn’t want to have to deal with reading charts from my phone. Thankfully Amazon Prime Now managed to get ink to us Tuesday morning. Also thankfully I realized the charts were pretty easy to memorize so I didn’t have to refer much to the print-out anyway. But on to the knitting. Since Tuesday was only a site visit – which requires tromping around but no sitting in meetings – I got up extra early and plowed through half a sock before we left. The trip down was about four hours straight of driving. I wasn’t the one driving, and half the drive was through twisty, windy roads and up and down hills, but half was pretty straight. So I decided to give knitting in the car a try. I wasn’t honestly sure how it would work out – I am prone to getting queasy when not the one driving, especially on hilly and twisty roads. But on the way down, I managed to finish up the first sock just shortly before the roads started to get a bit bumpy and windy. I cast on the second sock Tuesday evening once back at the hotel and managed to get in a couple pattern repeats before I was just too tired to keep my eyes open anymore. I turned the heel on the way down to the meeting Wednesday morning, and on the way home, the instant we made it out of the hills and I felt like my stomach could handle it, I dove back into knitting. By the time I got home last night all I had left was the toe. I scurried in the door, dumped my stuff, waved to Richard and the cats, and then sat down and hastily finished it off. Yarns are Knitpicks Stroll in Dove Heather and Pansy, because I know someone will ask (I adore how the tone-on-tone purple works in this!). I’m quite pleased with these, and with my placement – 62. Managed to get them done in just a bit over 48 hours, even with working two full days *and* a very long work road trip, all because it turns out I *can* knit (under certain specific circumstances) in the car. Have you ever tried knitting two socks/sleeves/gloves/what have you at the same time on circular needles? After I screwed up the length of enough things, I changed to two-at-a-time and it is much better for me.